Thought I'd create a thread to post nature photos. They don't have to even be "good" photos (I'll post a lot of those), just photos you captured of something cool or interesting. Please give a description of the photo. Here's a couple to start out. I'll add more as I sort through them. Here's one I love from a couple years back. I kayak on a local lake (Lake Galena) a lot and usually have my camera with me. 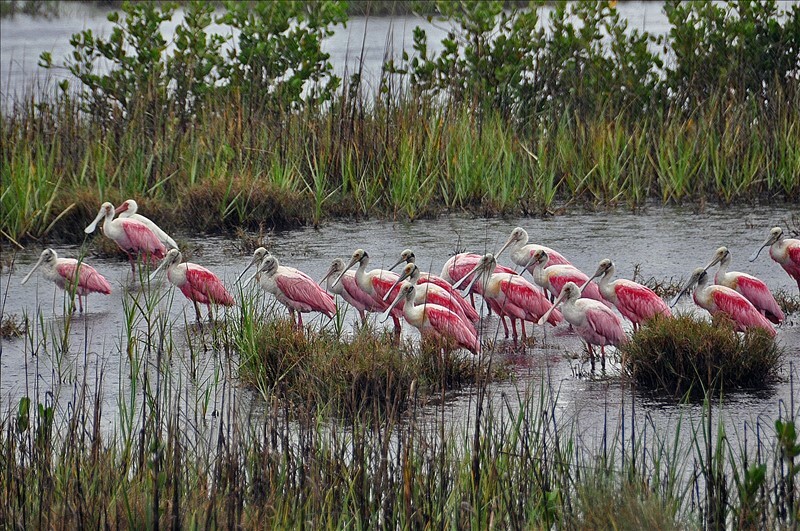 There's a lot of wild life to capture, but it can be a challenge on a kayak. There's a family of bald eagles near the lake (rare for our area) and while you see them frequently, they are hard to capture in a picture. It was a very windy day and I was paddling upwind when I saw an eagle fly over and it looked like it landed in some trees ahead. I pushed on, fighting the wind and waves until I rounded the corner and saw him (her?). I didn't want to startle it, so I kept my distant and used all the zoom I had. This is hand held, on a kayak, with small waves breaking over the bow. I'm still amazed I got any photo at all. Different kayaking trip, but same lake. I took this before I launched. He/she was posing for pictures. Same trip as as the duck, but this one was taken on the kayak. Soon after this picture they were spooked and scattered off the submerged log. One more kayaking picture. A blue heron taking off when I got too close. They sound like a dinosaur when they yell at you. 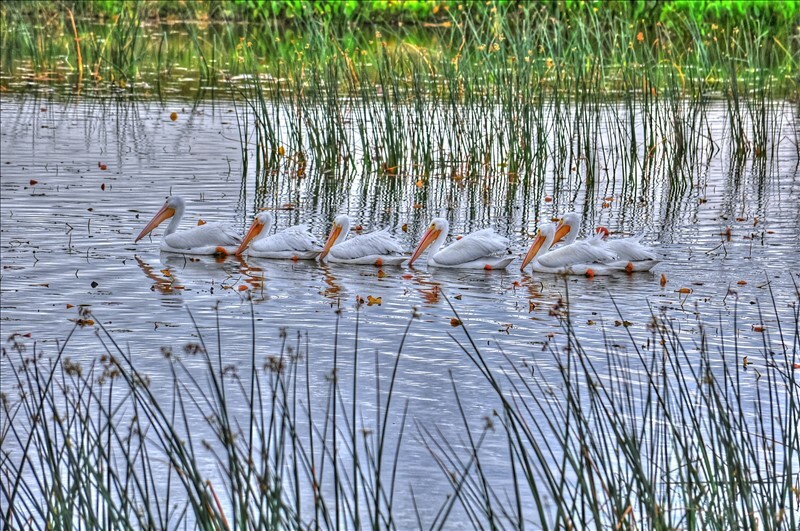 I don't really like these birds because they also visit my gold fish pond in the back yard, but they are pretty. One of mine. I love nature photography. Last one. I could go on and on. Awesome pictures Jimmy! 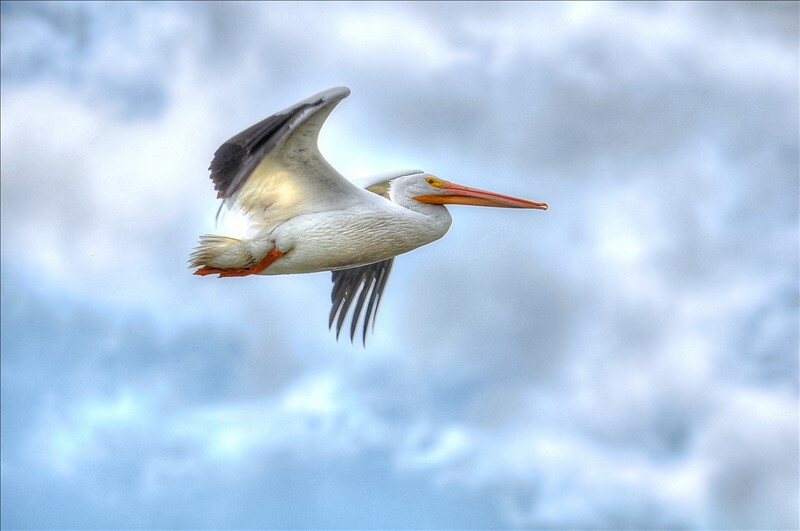 That pelican in flight looks like a painting! Keep 'em coming. Here's some baby bunnies from the back yard (huddle under the swing set playhouse). They're small enough to get through my garden fence and they clipped the majority of my green bean plants this year. First time they've ever done that. I'm going to need to install a finer mesh fence on the lower half next year. I think this is an American Goldfinch. Taken through the screen of a window. Surprised it came out OK.
Owl silhouette at dusk in the backyard. Great idea for a thread! 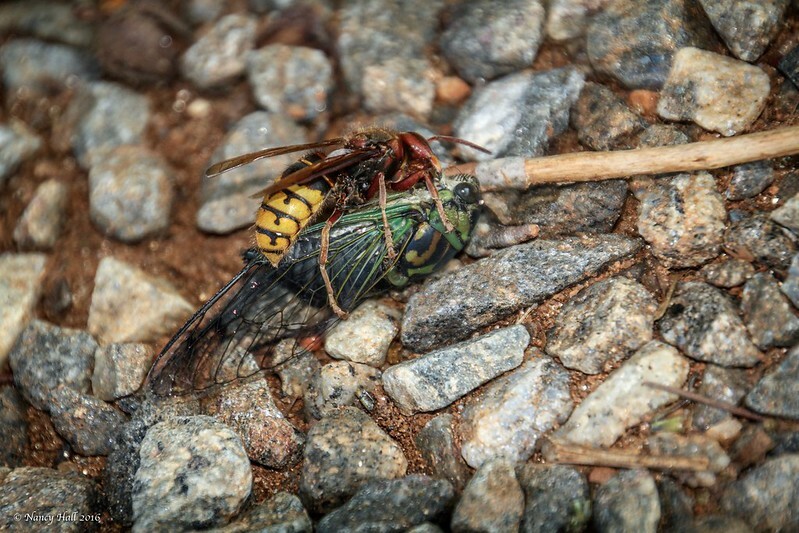 My contribution is this Cicada Killer Wasp and his prey. I came upon their struggle on one of my morning walks around the lake near my house....heard a commotion in the leaves and noticed these guys. When I first spotted them, the cicada's wings were still free so there was a lot of thrashing around, but it didn't take long before the struggle was over. These large wasps burrow in the ground making nesting chambers. Once this is done, the female goes out looking for a cicada. She paralyzes him with her venom and takes him back to one of the nesting chambers where she lays an egg on him and closes the hole with dirt. The egg hatches in one or two days and the cicada serves as food for grub. Pretty amazing! Very cool Nancy. Here's one that might drive people away from this thread. I was sitting on the back deck one night when I saw something scurrying across the deck. I though it might be a mouse, but when I looked I found this wolf spider. It's not a good picture, but if you look close, those lumps on her back are hundreds of baby spiders! Found this big guy at the Merritt Island Refuge. I hope you used a lot of zoom for that gator pic Jimmy! Here's a couple of pics from our California trip. This is Sequoia National Park. If you've never been, I highly recommend it. My son and I went for a hike and ran across this big boy. He was only about 20 feet off of the trail, so we passed very quietly and calmly. He didn't even care that we were there, thank god. Didn't use much zoom here. Here's where he was in relation to the trail. Further up the trail, we came across a momma bear and cubs. They were further off the trail, but we quickly left that scene when she looked our way. You don't mess with momma bears! The other cub was up a tree for some reason. My son was very nervous and was ready to go. Nehall's Cicada shot reminded of when they were in full roar here this summer. At first i enjoyed the sound but the novelty wore off after about three weeks. One morning i was sitting on the back porch at first light and saw something unusual at my feet. It was a white Cicada larva that had just started transforming into an adult. i sat there and watched the whole process for about an hour. One of the most amazing things i've seen in the natural world in my entire life! When it first flew, it landed on a potter friend's salt glazed pitcher that we'd been using as a watering can for the outdoor plants. Last week, we spent three days at a rustic one bedroom cabin near Blackwater Falls, WV. The unseasonably warm November weather we'd been having went downhill fast - night temperatures in the 20's with wind, rain, sleet, hail and a little snow for most of the trip. Only one afternoon of sunshine. Here's a view of the Blackwater Canyon, just down the road from us.